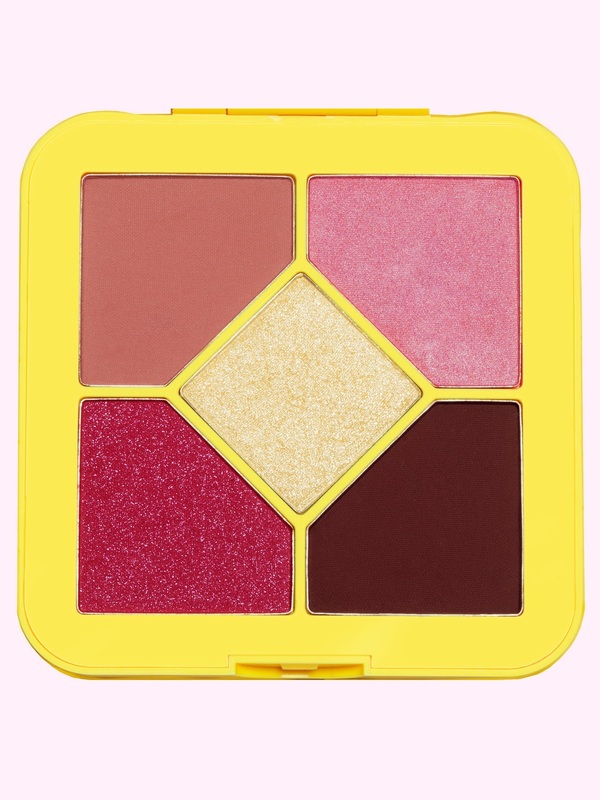 Inspired by 90s nostalgia, the Pocket Candy Palettes burst with poppy brights and almost-neutrals in a cutting-edge formula. This ain't your momma's vintage makeup! Why 5? Because sometimes, less is more. 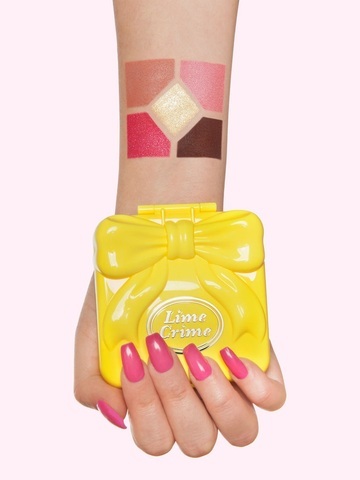 Unlike your everyday palettes containing a smattering of vaguely related colors in tiny wells, Lime Crime gives you 5 supershadows that always work together. 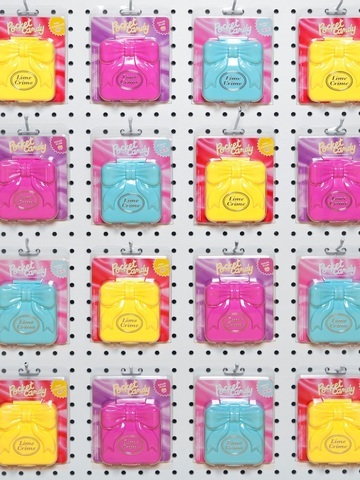 With Pocket Candy, you just can't go wrong! In fact, we think you'll love them so much, you'll appreciate the extra. Each color is carefully crafted with high-end pigments that deliver maximum payoff and smooth-as-butter performance across all shades & textures. 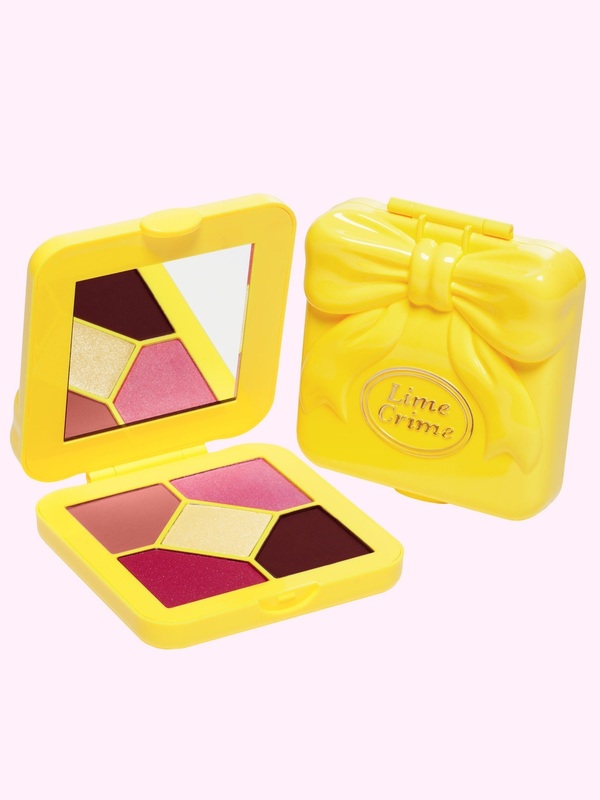 Pocket Candy pressed shadow palettes contain eye & cheek colors and come in a quality-made, glossy mirrored compact that's totally collectible. Best of all? It fits in the pocket of your jeans! 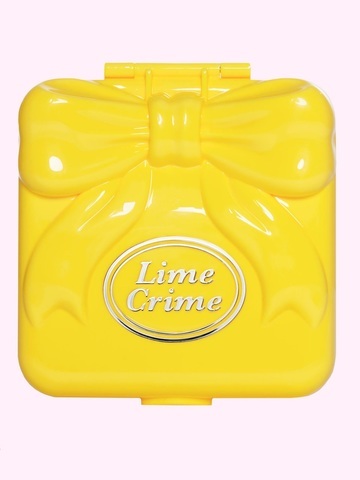 This Lime Crime product is inspired by the toys of our childhood but not affiliated or endorsed by any other company. BABY CAKE: Mica, Ethylhexyl Palmitate, Zinc Stearate, Phenoxyethanol, Caprylyl Glycol, Talc, Ethylhexylglycerin, Hexylene Glycol. May Contain [+/-]: Titanium Dioxide (CI 77891), Iron Oxides (CI 77491, CI 77492, CI 77499), Yellow 5 Lake (CI 19140). BROWN SUGAR: Mica, Silica, Ethylhexyl Palmitate, Zinc Stearate, Dimethicone, Phenoxyethanol, Caprylyl Glycol, Talc, Ethylhexylglycerin, Hexylene Glycol. May Contain [+/-]: Titanium Dioxide (CI 77891), Iron Oxides (CI 77491, CI 77492, CI 77499), Yellow 5 Lake (CI 19140), Red 6 (CI 15850), Red 7 Lake (CI 15850). LEMONADE: Mica, Calcium Titanium Borosilicate, Aluminum Calcium Sodium Silicate, Ethylhexyl Palmitate, Zinc Stearate, Silica, Phenoxyethanol, Hydrogenated Polyisobutene, Caprylyl Glycol, Ethylhexylglycerin, Hexylene Glycol, Palmitic Acid, Benzoic Acid. 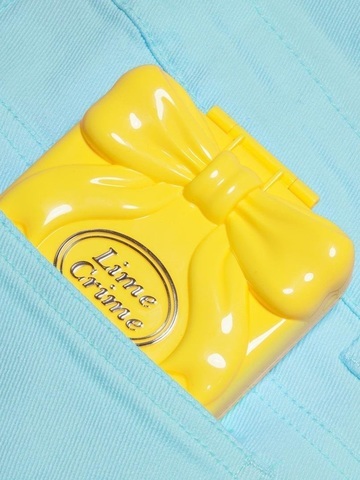 May Contain [+/-]: Titanium Dioxide (CI 77891), Tin Oxide, Yellow 5 Lake (CI 19140). PINK JELLY: Mica, Ethylhexyl Palmitate, Alumina, Zinc Stearate, Silica, Hydrogenated Polyisobutene, Phenoxyethanol, Caprylyl Glycol, Ethylhexylglycerin, Hexylene Glycol, Palmitic Acid. May Contain [+/-]: Titanium Dioxide (CI 77891), Red 7 Lake (CI 15850), Red 30 Lake (CI 73360), Iron Oxide (CI 77491), Tin Oxide. STRAWBERRY: Mica, Ethylhexyl Palmitate, Calcium Sodium Borosilicate, Zinc Stearate, Synthetic Fluorphlogopite, Silica, Phenoxyethanol, Caprylyl Glycol, Ethylhexylglycerin, Hexylene Glycol. May Contain [+/-]: Titanium Dioxide (CI 77891), Red 7 Lake (CI 15850), Red 6 (CI 15850), Tin Oxide. In U.S. only: shades Brown Sugar/Pink Jelly/Strawberry are not recommended for immediate eye area. Lime Crime products are PETA verified vegan and Leaping Bunny certified cruelty free. Our products do not contain any animal-derived ingredients. As part of the Leaping Bunny pledge,our suppliers also certify that no animal testing is ever performed at any point in our supply chain.